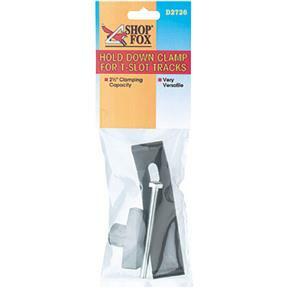 The Hold Down clamp slides in the T-Slot Track sold separately and quickly secures with the turn of the hand knob. 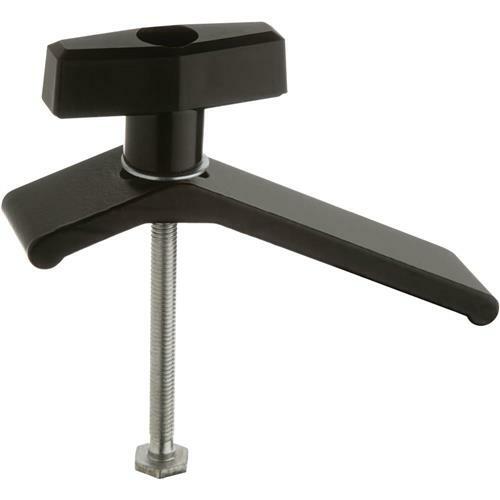 By turning the clamp head 180 degrees to the workpiece, the clamp offers a dual capacity of 0 to 3/4" and 3/4" to 2-1/2" depending upon the size of the workpiece. See H0876, H0877 and H0878 for T-Slot Track. If youre looking for a low-cost hold down then this is for you. Bear in mind that its cheaply made, the threads on the bolt my or may not need to be cleaned so they work smoothly. Also the bolt head is a little undersized for the T-track, well for my application which is a Shark HD4 CNC machine. No frills, some sharp edges that need filed down. It does the job but a little expensive when compared to competition. They are well made and I paid a lot less that I would have at the other sources. I received this and use it on my cnc for wooden parts. Works great. I got exactly what I expected as I usually do from Grizzly. Good job. Missing washer from sealed packages (bought 3). Had to run to hardware store. Work great with all parts. These work good, would be great if it came with another shorter bolt.